Recently, I reviewed five Smart LED light bulbs that could help you automate your home. One of the products was the Belkin WeMo Lighting Starter Kit, which included a WeMo Link hub and two Smart LED light bulbs. 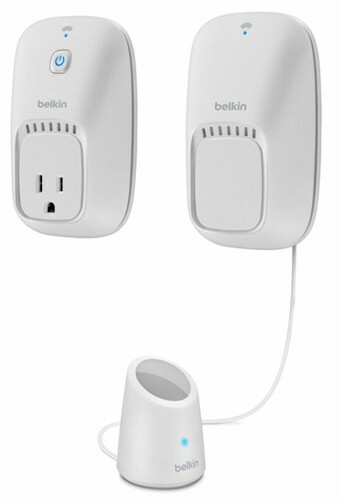 If you've already started down the Smart Home path with Belkin WeMo products or are thinking about it, the Belkin WeMo Switch + Motion kit could be either a logical extension to your existing WeMo infrastructure or another good way to start. Unlike the Smart LED bulbs that communicate via a Link hub using ZigBee, both the WeMo Switch and WeMo Motion Sensor are Wi-Fi only devices. You can add them anywhere you have Wi-Fi coverage in your home. As shown in the prodct photo above, the kit includes two products: a WeMo Switch (Model F7C027fc); and a Motion Detector. The WeMo switch was one of the original products in the Belkin WeMo product line and is still available as a separate product for about $45. The kit, which includes the Motion Sensor, sells for $74, so you're paying about $29 for adding motion sensing capabilities to your Smart Home infrastructure. The WeMo Switch turns power on or off to its socket. It is rated at 1800 Watts, so you can control just about any appliance rated up to about 15 A. As power is turned on or off, you'll hear a relay click. There's a single status LED that glows solid blue if it's connected to your Wi-Fi Network. There's also a handy power on/off switch to manually control the outlet if you don't have your mobile device handy. The WeMo Motion Sensor consists of two pieces: the device that plugs into the wall containing the Wi-Fi and control circuitry; and the motion sensor tethered to the wall plug with a 6 foot cable. The sensor plugs into the back of the wall unit with what appears to be a standard 3.5mm stereo plug. If the 6 foot cable isn't long enough, you might be able to extend it with a stereo audio extension cable, but I didn't try that out. The sensor has a single blue LED that blinks to indicate motion has been detected. The blue LED also shines through the translucent plastic located on the top of the sensor. The component plugged into the wall has a single status LED that functions just like the status LED on the WeMo Switch. Both devices that plug into power outlets share a common shape. The WeMo switch plugs into a standard three-pronged outlet. The WeMo motion sensor does not have the grounding pin. The plug is offset so that you can plug it into the top outlet of a standard duplex outlet and still have use of the lower outlet. Step 2: Download and install the latest WeMo App. Step 4: Launch the WeMo App to complete the setup. If you have previously set up other WeMo devices on your Wi-Fi network and have elected to save your credentials, the setup program will automatically attempt to connect to that network. Most likely, the next message you'll see is that setup is complete. Step 5: You may be prompted to update the firmware of the devices.